The best (and consequentially, hardest) position in a dog fight is directly behind your opponent. You get a shot, and they don’t get to return fire. But that’s not the end of it. The benefit isn’t just getting to take a shot, it’s getting to take shots turn after turn until that enemy is dead. 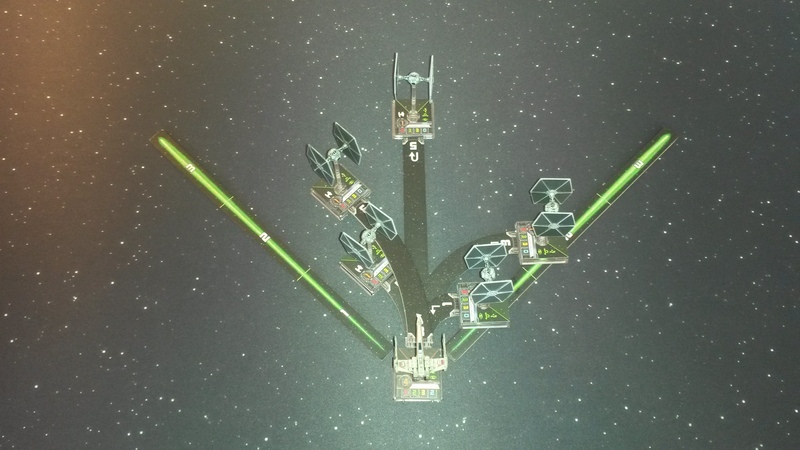 Here we have an X-Wing in a very favorable position, directly behind a TIE Fighter. But, with three green dice and an evade action, it’s going to take more than one round of shooting to bring the TIE down. Here we see the range of possible maneuvers the TIE can take in the next turn. Let the guessing game begin! Actually, there’s no need to guess where the TIE Fighter will end up. 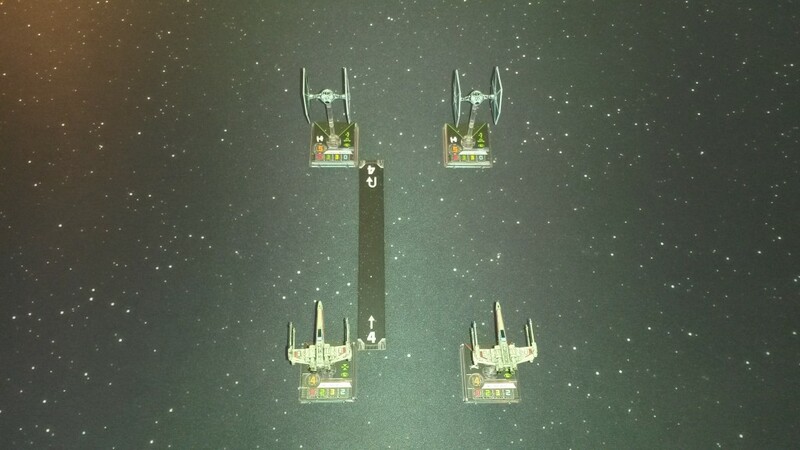 All the X-Wing needs to do is move into the TIE’s old position. Now, no matter where the TIE lands, the X-Wing will have a shot on him. 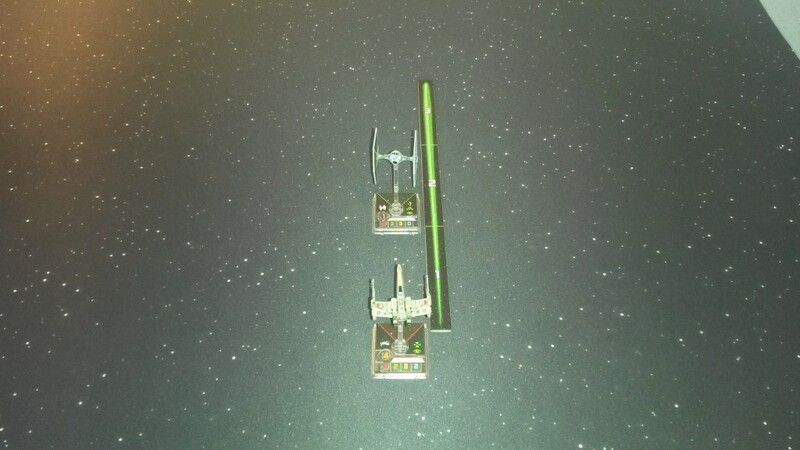 By flying more aggressively, the X-Wing could have gotten better range on the TIE, but he risks picking the wrong direction to turn or overshooting the mark. Better to play it safe and get the shot, and continue to follow until enough hits land. Of course, nothing in space combat is this simple. Pilot skill can make a huge difference when it comes to keeping up with your quarry. 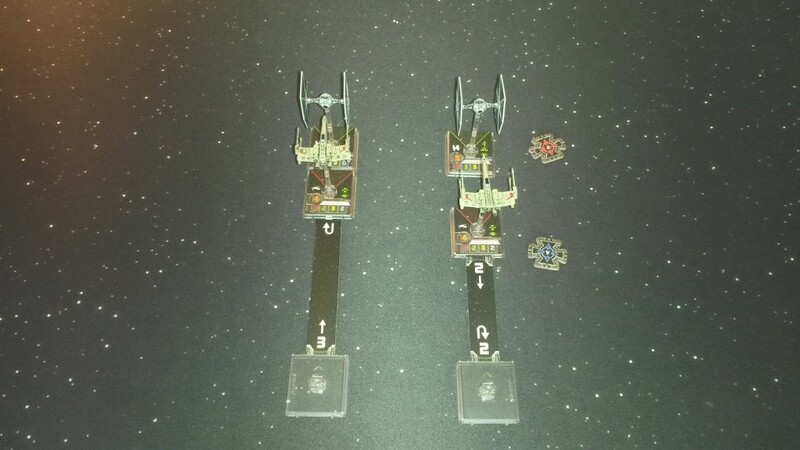 In this next scenario we have a PS4 X-Wing trying to follow a PS5 TIE Fighter. The TIE sits just a smidge within a speed 4 forward maneuver. The options for our X-Wing aren’t great. If he does a 3 or 4 forward, he’ll bump and lose his action. In order to take an action, he can only do a 2 forward. 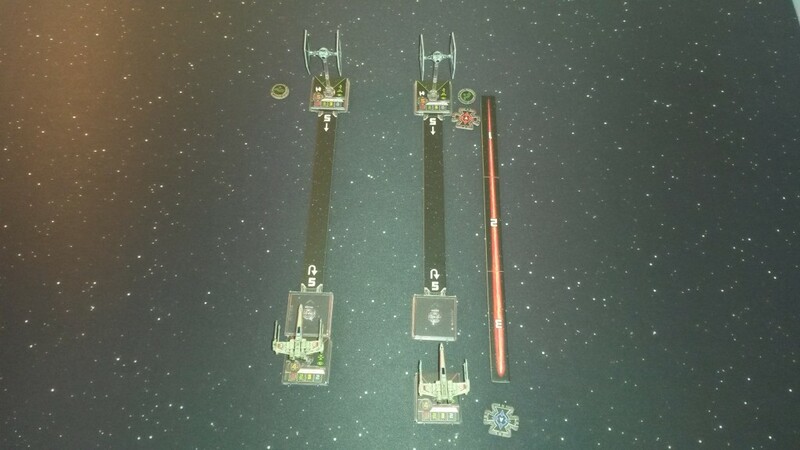 Fortunately for the X-Wing, even if he does a 2 forward and the TIE responds with a 5, the TIE will still be in range, and is going to have a hard time escaping on subsequent turns. As any experienced player will tell you, getting directly behind the enemy is rare. What’s more common is something like this next scene. 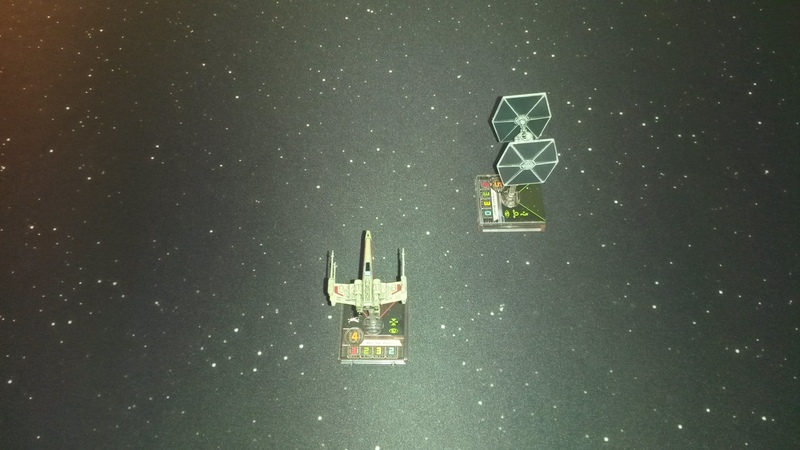 If the TIE were to move first, the X-Wing could do a 2 turn and land right where the TIE is sitting, and be guaranteed a shot. But, our X-Wing has the lower pilot skill. Since he has to move first, a 2 turn will cause him to bump into the TIE and lose his action. 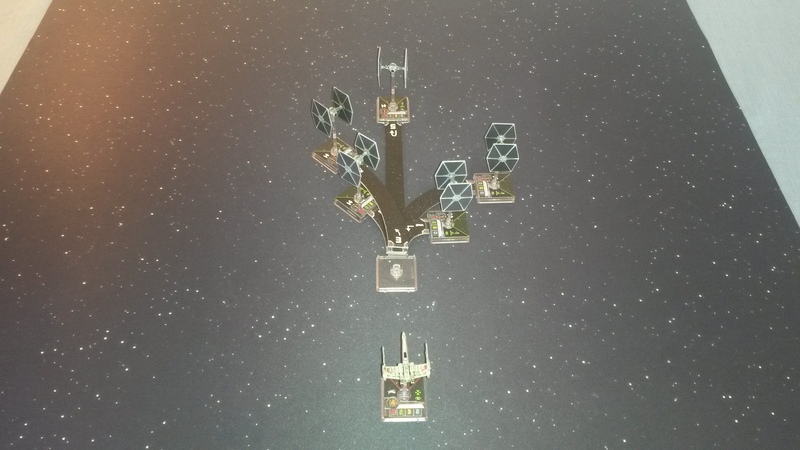 And now, just to make things even worse for the X-Wing, the TIE has performed a 3 turn, and is able to clear the X-Wing’s arc. 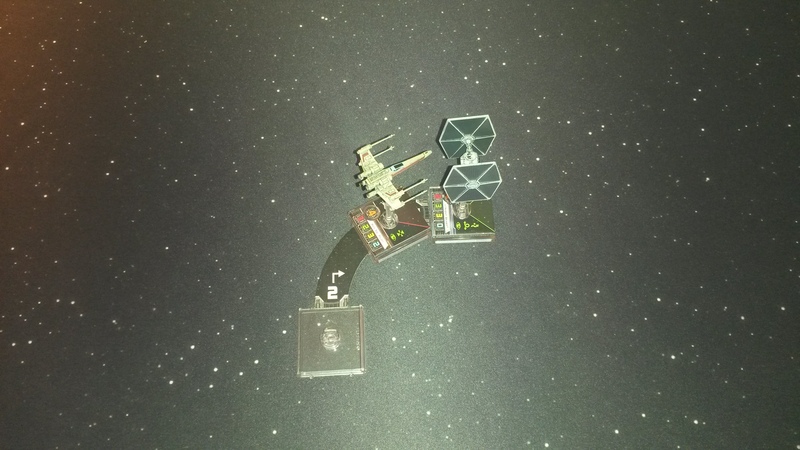 The X-Wing could follow up with his own 3 turn in the next round, but he’s lost a round of shooting, and will be a bit out of position to continue following. This is just one of the many benefits of having a higher pilot skill, and it illustrates the importance of thinking your plan through in the order that ships will move. 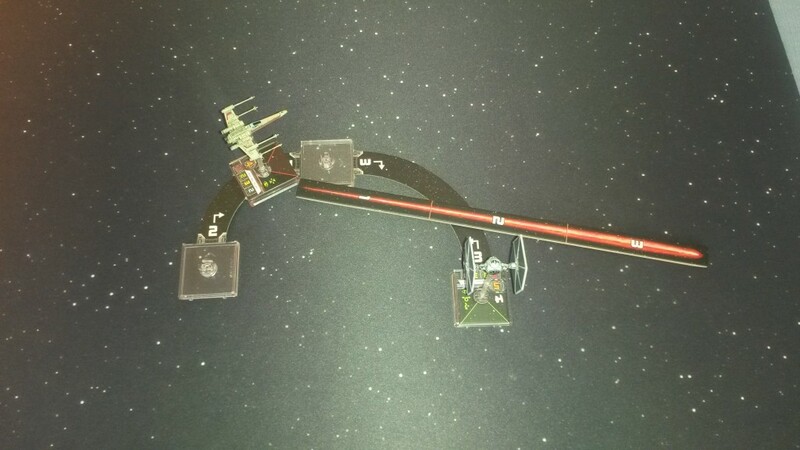 In this case, it may have been better for the X-Wing to k-turn. He’d be stressed, but get a shot, and be in a good position to chase down the TIE later. To see what to do if you should find yourself being chased, move on to the next lesson, I Know A Few Maneuvers. First I want to say, I really like your blog so far, keep up the good work. I do want to point out though the “sure shot” scenario ignores the fact that the tie can barrel row. A hard turn and barrel roll is likely to take you out of any arcs the X wing gets unless he is able to predict your exact maneuver. Check the next lesson, “I Know a Few Maneuvers,” which discusses the moves that will get you out of arc. Ahhh. I see that now. I shouldn’t hjave jumped the gun like that. Great work!